Are you thinking about ordering a takeaway this weekend? Nothing wrong with that! You can still enjoy a takeaway and make healthy choices. We are sharing our favourite healthy takeaway orders and some little swaps you can make to save calories. If you are trying to make some healthier changes, that doesn’t mean you have to cut out takeaway. Simply make some swaps, try something different and you can save yourself a lot of calories and still enjoy your favourite weekend meal. Pizza is probably one of the most popular foods to order. Popular with especially students and kids, there is usually a pizza that everyone can enjoy as there is so much choice. Although it is not one of the healthiest foods, you can make it healthier. Ordering a thin crust is the best way to start. The base does not have much flavour anyway, it is all in the toppings, so keep it thin. Always remember that you can order off the menu, so don’t be afraid to ask. Most pizza comes dripping in cheese, so ask them to go light on the cheese. My favourite way to make pizza a little healthier is to make sure it is piled high with veggies. You can always go for a half and half if the person you are ordering with wants something more calorific. Indian food can actually much healthier than people think it is. Most people go straight for creamy curries (don’t get me wrong, they are amazing) and are missing out on the other delights that you can order. 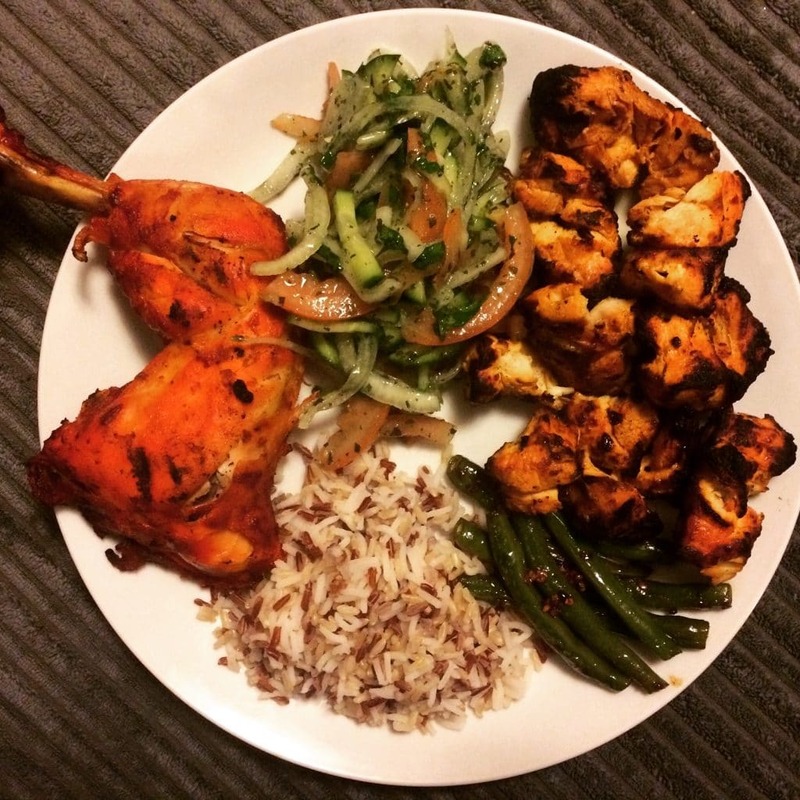 My healthy Indian choice is always tandoori chicken – it’s perfectly cooked and full of flavour. Add a little bit of mint yoghurt with it and YUM! More and more places are now offering brown rice, but you could always cook up your own to go with it. If your local Indian takeaway has it, order a onion salad – they are so, SO good, and low in calories. We usually order the basics, like meat and rice/potatoes from the takeaway and cook up our own vegetables to go with it. It’s probably best to avoid anything with the word crispy in it, as it’s usually deep fried. Instead, go for steamed dishes or stir fries and try to stick to the vegetarian options, or get a side of veg to mix in to it. Kebabs were a staple when I was a student, but think back to the ones that I used to eat makes me feel a little bit queasy. 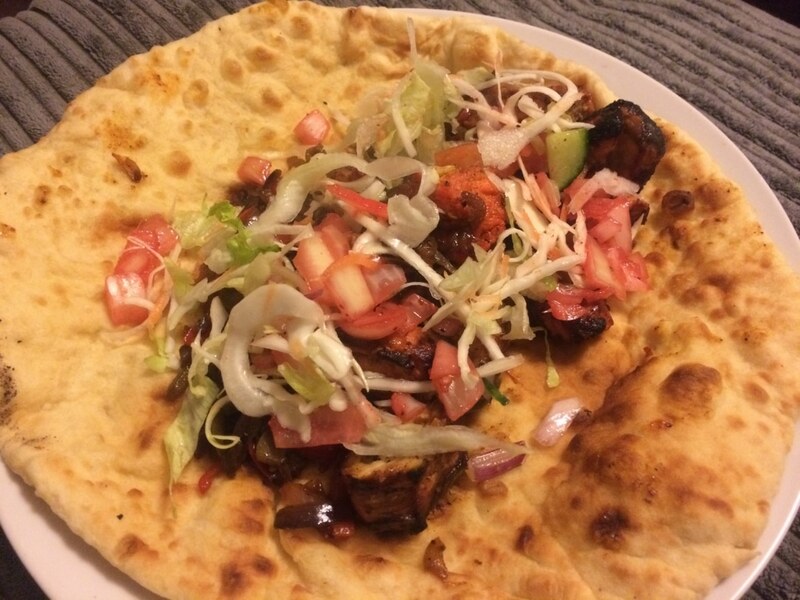 Most Middle Eastern takeaways will offer some kind of chicken kebab that you can have packed full of salad. Skip the creamy sauce and get chilli sauce on it instead and maybe cut the naan in half (if it usually huge) and you have yourself a fairly balanced meal. For a takeaway anyway. Middle Eastern restaurants usually have lots of great side salads on offer too, so fill up on those. You can get some hummus and dip carrot and cucumber in it, or there are lots of grilled meat options. Add some mushy peas or beans to your order for some fibre, and fill up on those first. Chips are a must when it comes to going to the chippy, but try to eat the thicker chips, as they absorb less fat. Half the portion of chips too, as they are HUGE and ask them not to add any salt. If you can, have the fish coated in breadcrumbs rather than batter. However, if it does come with batter, you could always remove half or all of it. If it is just once a month, nothing wrong with going all out. Such a great post! I’m starting my diet tomorrow and seriously can’t stop ordering pizza at the moment! try making your own – it’s really easy. 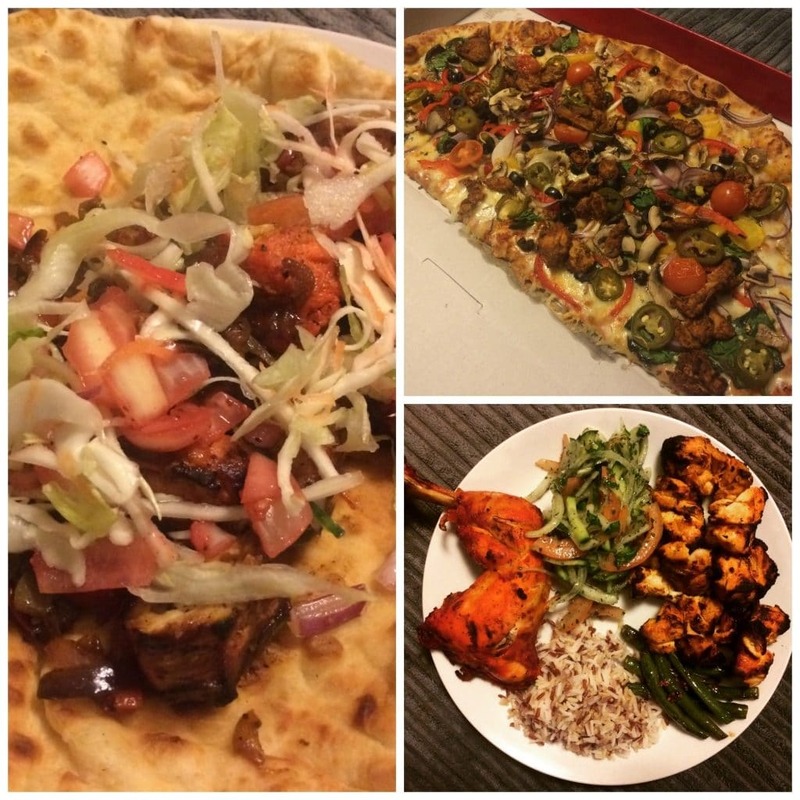 I usually do just go all out for takeaways – ashamedly! Though the above choices look yummy. I love tandoori chicken too. Going all out once in a while is fine. It’s when it becomes a habit it might be an issue. I admit, if have a takeaway im not thinking healthy! Unless it is a Greek kebab. I am so with you on the Tandorri chicken, that is what I always order when I get a takeaway! I can remember us ordering a takeaway a few days after Finley was born when there was no way I could cook. It was amazing! It’s so good, isn’t it? Especially with a nice salad. I really need to start making healthier choices when having a takeaway, I am terrible at ordering food that is dripping with grease! Once in a while there is nothing wrong with that, but if you order quite often, then it is best to go the healthy route. I especially like the tandoori chicken tip. I’ve only recently moved back to the UK and am all out of practice with my Indian ordering! I bet tandoori chicken is easy to make, too, but then sometimes on a Friday night you don’t want to make ANYTHING for yourself! When I lived in Greece, it was a bit easier to order healthy takeaway. At their souvlaki shops, you can order grilled chicken skewers with yoghurt tsatziki sauce and just skip the chips. They sell lovely fresh salads, too. 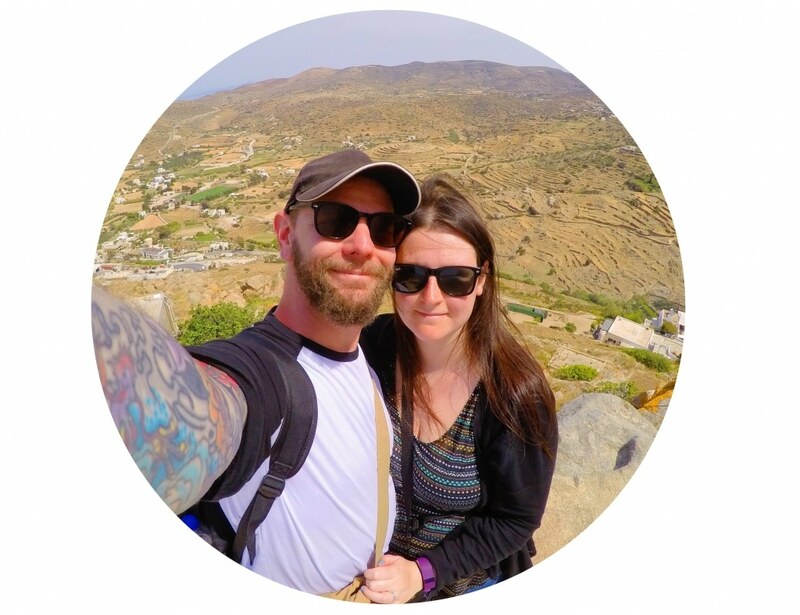 Aaargh, now I want to go back to Greece! You are making me want to go to Greece too. The food I have had in Greece is some of the best in the world. It was. So easy to make as well. I used yor tips last night and just ordered some tandoori chicken and I made my own sides. I thought I would feel jealous of everyone with their curry, but I felt totally satisfied and no guilt or bloatedness after. Yay. I am so glad they helped and that you enjoyed your meal too. I havent had a take away in forever, although we are so lucky in brighton as there are so many places to get takeaway that are vegan and healthy! I really need to visit Brighton. 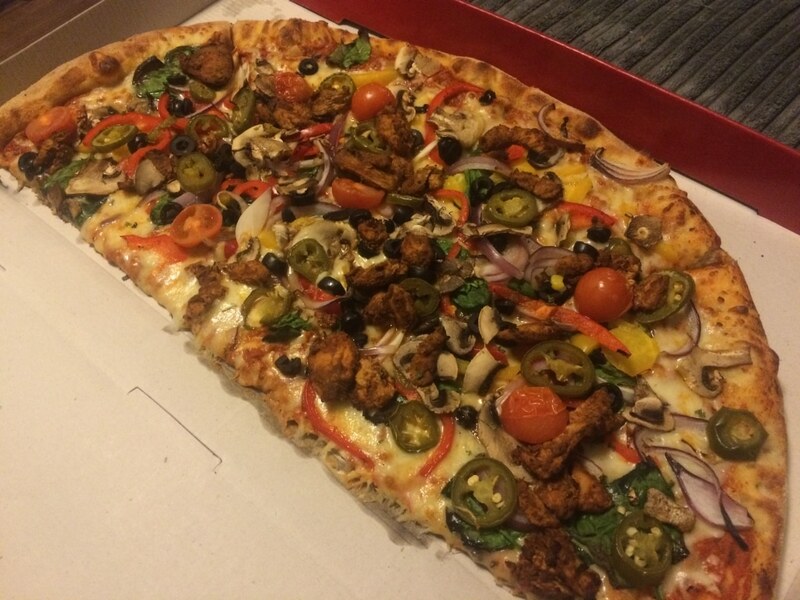 Veggie pizza is my favorite hands down, and I love tandoori chicken! The more vegetables the better I say! Wow what great tips! My boyfriend and I love eating out on the weekends and I am always trying to find a way to choose the healthier items. Thanks for sharing! Extra veggies is usually the way to go. I definitely use the tip of customizing my order a lot to make it as healthy as I want it. I like big salads with things like dressing/cheese on the side, as well as asking for things to be cooked with light oil or butter since sometimes they really pile it on! I think sometimes people are scared to customise their order, but as long as you are not trying to ask them to make things they don’t have, there should be no problem with it. Couldn’t agree more with you on Indian food! As an Indian I have to say that traditional Indian food is super healthy..we do not eat naans and creamy curries in our home..that’s party food…we make it or eat it only on special occasions. What we do eat is wholesome meals consisting of lentils, whole wheat roti (flatbread without any oil) and lots of veggies..this is our normal meal. These restaurants in the west have painted such a wrong picture of our food..sad! It’s always interesting to hear how traditional cuisine is changed. I think most of the curry we have here in the UK would never be eaten by someone in India. We rarely order takeaway. In fact, I think possibly only once in the four years we’ve lived in our current house have we had one delivered! We might grab something from the chippy if it’s been a long day and I can’t be bothered to cook but usually on those days I will throw a pizza from the freezer in the oven myself. I nearly always top up the pizza with extra veggies. A pizza isn’t a pizza to me unless it’s completely overflowing with vegetables! We have just had a new chip shop open round the corner from us. It smells amazing. When I order takeout, I do not eat the whole portion size because they are way too much. So i save some for later. All about moderation. They are huge, aren’t they. Takeaways are not my thing but if there was any healthy takeaways near me I would definitely use them once in a while. I know there are healthy takeaways in London so I am a bit jealous of those people living there… 🙂 When we don’t feel like cooking we normally go to a restaurant with healthier choices. I am actually in Manchester this weekend. Would you recommend any restaurants with healthier choices but not Indian (don’t like spicy food)? Hello, sorry for the delayed reply. If you are still in Manchester, then I recommend Earth cafe or 8th day. Thanks Dannii! I know of 8th day cafe and been there before once. I wanted to go today actually but they are closed on Sundays :-(. I don’t think i’ve been to Earth cafe before so I will keep it in mind for next time, thanks! I wish it was open on Sunday too. They would be so busy! The only take away I would have is pizza- I am so fussy and don’t like curry or Chinese food or things, and I don’t like thick pizzas that much- I much prefer thin ones. We do buy the supermarket thin ready to cook pizzas as a treat- we add more pepper often, and serve with a salad. I think it’s all about balance really- if you are having takeaways all the time they are not good for you, but if you have one every now and then I don’t think you need to worry about it really. You can’t go wrong with Pizza, can you!